Thank you for inviting me here today to join in this commemorative service and to reflect on the legacy of General Sir John Monash. I have to admit that before I received a John Monash Scholarship, I didn't really know terribly much about General Sir John Monash. I knew he had played an important role in World War 1, and I knew he was what my husband would describe as a 'great Australian' (whatever that meant). But that was about all. At that time I was working as a solicitor and I wanted to do further study. I felt that there was a gap in how our society and our legal system were approaching the position of minority groups in a multicultural society like Australia. It seemed to me that these groups were disadvantaged in a variety of ways when dealing with our legal system. This was particularly the case for those from different linguistic backgrounds, who did not speak English well. I wanted to do further research on how the legal system could better respond to the needs of these members of the community. At this point, someone suggested that I apply for a John Monash Scholarship. I looked into it, and I wasn't sure if it was for me. The Scholarships seemed to emphasise 'leadership' and 'leadership potential'. As someone whom my brother has always affectionately described as a 'nerd', I didn't think this sounded like me. Leadership was something for captains of sporting teams, not academic types. And Monash himself was a military general, which to my mind was like being the captain of a sporting team par excellence. But as I looked further into the Scholarships, and into the story of Monash himself, I realised two things. The first was that a John Monash Scholarship represented an amazing opportunity. The second was that Monash himself was an amazing person, whose experiences and ideas were relevant to me, and in fact to all Australians. Secondly, Monash was an 'outsider' (as in the title to Roland Perry's classic biography). He was the son of immigrants, and he was Jewish. In early twentieth-century Australia, these characteristics marked him as outside the mainstream of society. Yet in spite of this, Monash went on to hold key leadership roles in both the military and civilian spheres. His story thus demonstrates the importance of including all members of society in public life, of giving all groups the opportunity to contribute to building our community. This resonated with me and my ideas for research into the position of minorities in our society. In particular, the importance of inclusion has been central to my work on linguistic minorities and the law, and has driven my recent research into how language creates 'outsiders' in the international legal system. Monash's life and contributions to society call us to question our prejudices, and offer a powerful reminder of what we gain as a society when we respect, value and include 'outsiders'. Thirdly, Monash emphasised the value of education for the 'duties of citizenship', that is, to serve society as a whole. He argued that society thrives when we use our experiences not just for our own benefit, but for the good of our community. Monash lived this idea, continually using his education and experience to serve others. We have heard today, for example, how Monash drew on his experiences at Gallipoli to avoid the same mistakes on the Western Front. This idea has take on a particular personal significance for me recently. Two years ago, my youngest daughter, Mary, died when she was just a few days old. She died from complications with delivery, which caused a fetal-maternal haemorrhage just minutes before she was born. What happened to Mary was impossibly rare. But in the weeks and months which followed her death, I met many other parents whose babies were stillborn, that is, they died before they were born, in the late stages of pregnancy. And stillbirth in Australia is, sadly, not rare. Six babies are stillborn every day in Australia. That is one every four hours; and that is twice the national road toll. This is, quite simply, a tragedy. But there is evidence from other developed countries with significantly lower stillbirth rates that, in a large number of cases, stillbirth is preventable, and with proper intervention and public awareness campaigns the stillbirth rate can be dramatically decreased. In the months after Mary died, I was in a fog of grief. But in the last few months, as the fog has started to lift, I've thought a lot about how to make sense of what happened, and how to honour her short life. And one of the ideas that has shaped my thinking in that regard is this idea of General Sir John Monash about the importance of education for bettering our society. Mary's death was, for me, an education - an awful, sorrowful education, but an education nonetheless. So what could come out of it for society as a whole? Having thought about this, I realised that I could take what I had learned from her death, and try to prevent others from suffering a similar loss. And so I came to commit myself to campaign for greater awareness of stillbirth, and to lobby for better prevention strategies, and better care for families who have suffered the tragedy of stillbirth or neonatal death. One day we might have a General Sir John Monash Scholar who dedicates him- or herself to stillbirth research. Certainly we have Scholars who have dedicated themselves to a wide range of fields, from indigenous health to management of water resources, from climate change to enriching Australia's cultural environment. And in this, we see the true value of Monash's ongoing legacy. General Sir John Monash was not just a hero of World War 1, a legend of the past. Rather, his ideas and values continue to shape generation after generation of Australians. That is an amazing legacy, and it is one I am honoured to pay tribute to today. Jacqui completed her PhD at the University of Cambridge in June 2008 and returned to Australia, to take up a position as a lecturer at Sydney University’s Law School. Her particular area of interest is international law and legal theory, with a focus on international human rights law. Her research focuses primarily on language policy and international law, looking at legal issues associated with accommodating linguistic minorities in multicultural societies. Jacqui also teaches in the area of commercial law and has a particular interest in international commercial issues. In 2009 she was awarded the University of Sydney Faculty of Law Award for Excellence in Teaching. 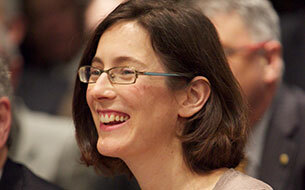 Jacqui also teaches on the European Masters program in human rights at the University of Sarajevo, Bosnia-Herzegovina. In addition, she practises pro bono as a barrister at the New South Wales Bar, and she has recently been appointed as the Revising Examiner in Public International Law for the Legal Profession Admission Board of New South Wales. She is closely involved with the Monash Foundation through membership of the National Selection Panel.